Crab dip, crab melts, crab cakes – all are delicious ways to enjoy fresh blue crab from the Chesapeake Bay. This Crab Pie recipe just blows everything else out of the water, so to speak. Make this easy pie for your next family gathering, and get ready for the accolades and the “I need this recipe!” comments. 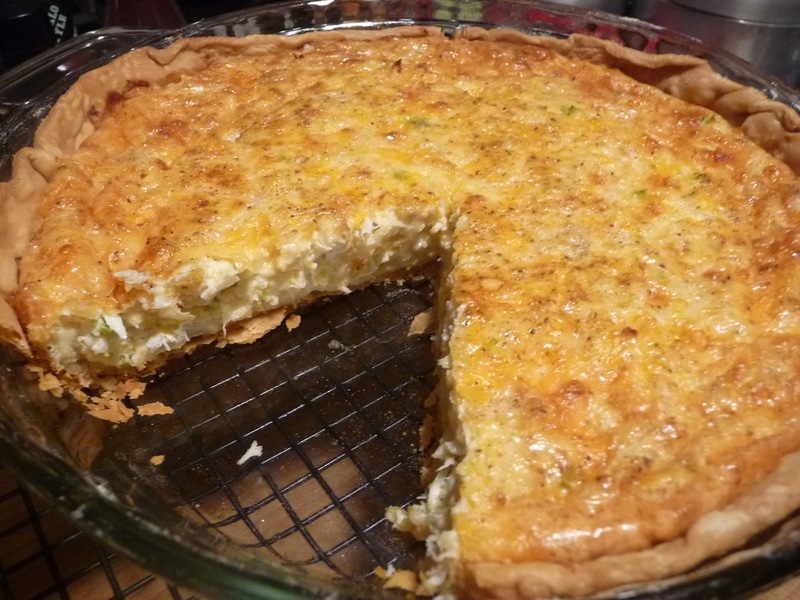 Crab Pie is a rich, savory, almost quiche-like pie that is very satisfying. With one bite you will say “wow”. This is a “stellar” appetizer or even entrée to take to your next family gathering that will just blow away any dip that you used to bring. * – We used backfin, and it was fine. Lump is the most expensive and not necessary. Pre-heat oven to 350º – par bake your crust for 3 minutes. We used Pillsbury pie dough and it worked out great. We did spray the pie pans with Pam spray to keep the crust from sticking. Combine eggs, flour, mayonnaise and milk, mix well. Add remainder of the ingredients (except crab meat) and mix well. Fold in crab meat and try not to separate the lumps of crab meat too much. 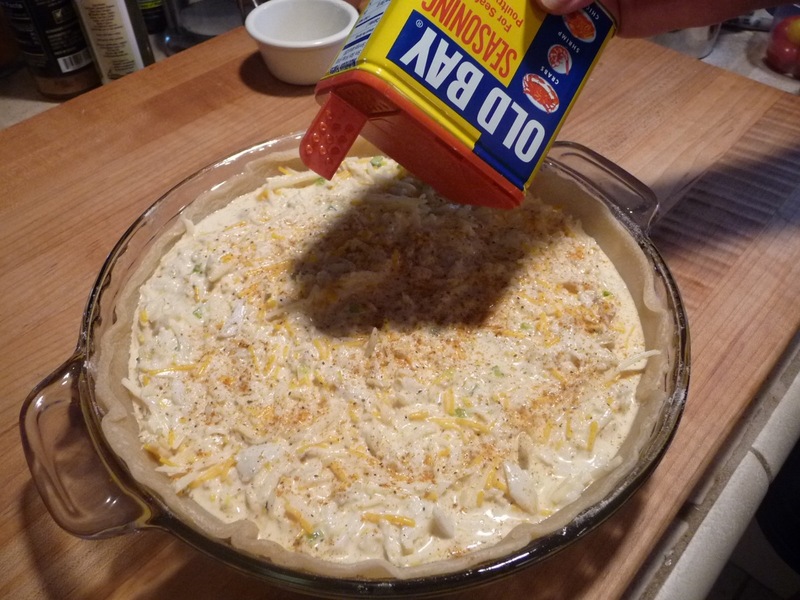 Pour into 2 separate pie crusts, sprinkle with additional Old Bay Seasoning. Baked in your favorite pie crust, with a simple list of ingredients, Crab Pie is astoundingly delicious. 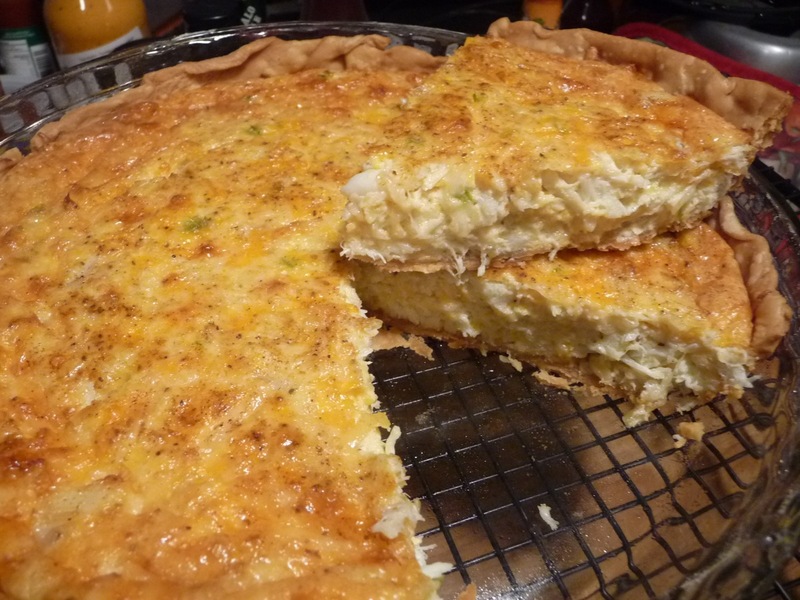 Think crab cake meets quiche. Spend the 90 minutes or so it takes to make (from start to finish), and you will be glad you did. After all, it’s crab. It’s pie. It’s a winner! Let us know if you make this dish. We’re here to help, just ask. There may be lots of folks out there that have never experienced the incredible sweetness of our Chesapeake Bay treasure, but if you ever have the opportunity to try these babies, you will love them! If you only have access to pasteurized canned crab meat (refrigerated in the seafood department, not the cans on the grocery store shelf), go ahead and try this recipe and let us know what you think. This is by far the best use of crab meat in a recipe that I have found. I’m baking a couple of these for my family reunion in 2 weeks, and I don’t think there will be any leftovers! hey Aunt Bea, sorry to reply to your comment so late. I’m sure the combination of the backfin and lump works great. Let us know if you made these, and how they turned out! PS, they should know by know that even one blackeyed pea makes for a luckier New Year! I LOVE crab, and those crab pies looking amazing! Wow, I am so excited to try this. Living down on the bay, I can get to crab almost daily. Nothing tastes better than a fresh blue claw — that 20 minutes earlier was swimming in the Bay. Life at times is oh so good ! Thank you again. Just made this for a ladies luncheon today and everyone loved it. Each pie makes 6 generous slices and along with a salad made a nice meal. I had guyere (?) cheese which I used in place of the Swiss. I used lump crab I bought at Sams. Thanks, Jean, for letting us know. Glad you and your friends liked it. This is great. I first had it at Thanksgiving dinner when our host made it. I loved it so much I had to try the recipe. I made it for a Christmas dinner and it was a hit. I expect it to be an even bigger hit today for our Super bowl party! I think I may like it more than crab cakes! I used a spinach dip rather than mayonnaise and half and half rather than whole milk. Did you make it for the Super Bowl party? How did it go over or turn out? Glad you liked it Sandra! Mayo is primarily eggs and vinegar. You could probably substitute the mayo for eggs. I don’t like mayonnaise, either, but substituted ranch dressing and it was perfect! Hey, that’s a nice tip Becca! Thanks. 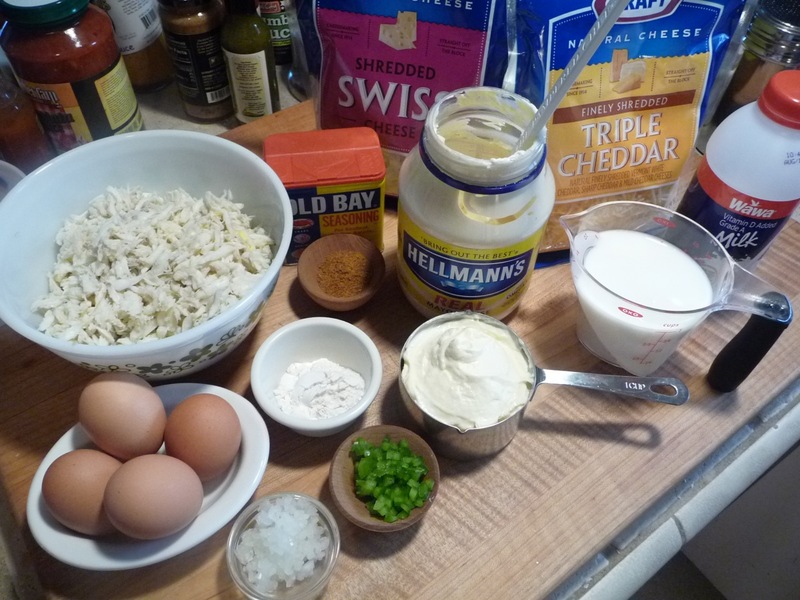 I’m sure there are a lot of folks that don’t like mayonnaise… but can tolerate some in a recipe like this. If you have access to fresh crab meat, you should. If you do spray the pie pan, make sure you do it lightly, or the crust will tend to slip to the bottom. It’s blue crab time again here in Maryland, and this is always going to be what I take to reunions and parties! Has anyone made it with lobster? I’ve not heard of anyone using lobster meat. But it sure seems to me it would work just as well. Let us know if you try that Linda. And thanks. It’s pretty amazing Anita. Good luck. I’m thinking about making this for Christmas, can i substitute the mayo? Julie, did you try it? When baked, you can’t tell there is any mayo in it. Let us know if you have any questions. I made it for Christmas n had my sister to taste it n she loved it. It came out alright n we love it. I told my daughter to try it. Thanks for the recipe! Post more on face book or send them to my email address. Thanks again. I have the same question about the mayo. Can you use light mayo or only the full fat version? @Julie and @Phay – you could certainly use low-fat mayo… just back off on it a bit to about 3/4 cup as the low-fat version is more watery. Hey Simone, did you try this for your dinner? This may seem like a silly question, but can you serve this cold? I’d like to take it to a party so I would need to prepare it ahead of time. Yes, the first time I ever had this Crab Pie, it was cold. Of course, if you could warm it up first, it does improve the overall taste. Has anyone tried freezing the crab pie after it is baked? @Messick – I’ve never tried freezing it. There’s usually not much left to freeze! But I don’t see why you couldn’t. LOL, now I know what you mean – there were only two small slices left in one pie after Christmas Eve Dinner. That’s awesome Messick! Thanks for letting us know. I’m hoping to do this for myself, but I don’t require 2 pies. I’m hoping by just making one I would just lessen the ingredients. Has anyone just made 1? @ChrissC – The ingredients are so simple, and easily halved. Go for it! Get out in that kitchen and bake me a pie! @Donica – That sounds like an amazing idea! Check at 20 minutes, shoot for 30 minutes total. You basically need the pie crust done and the eggs in the mixture cooked. Err on the short side of timing so as not to burn the crusts. Please let us know how they turn out. I love your idea of app sized pies! ~Brian. Abt to make this for my Christmas dinner! Excited….will have to post the response i get!!! @Renee – Yes please do post your experience! Good luck! It’s freakin’ delicous, Leash. Good luck! And Happy New Year! Can you use the pie crust already in the pan instead of using the glass ones. @Carolyn – yes absolutely. This is basically a quiche that you are heating up. You still need to thaw and pre-bake the crusts. I’ll be making this ahead of time for a party the next day. How long at what temp to heat it up? Thanks. @Shelly – I would reheat, covered with non-stick foil, at 300-325º for about 15 or 20 minutes. You’re just warming it through. Uncover for a few minutes and the end if you want to “crisp up” the top. BTW, it’s almost as good cold or near room temp. Yay! Glad to hear it Lanorma. Lanorma, I had the same reaction as your mom the first time I tried this pie, LOL! Made these for Christmas breakfast. Absolutely delicious! I used gouda cheese in place of swiss. Great! Thanks, Courtney. Merry Christmas! Thanks, Evelyn! Glad it turned out good for you. Nice job substituting for the Old Bay seasoning. Keep in mind, however, that the celery salt is a key ingredient of Old Bay. My sister n law post this yummy pie on her page I am going to make it tonight for my family ,I never saw anything that you can taste from the picture lol you know what I mean yummy like I said. Muriel, I give credit to hubby for the great pics, but you are right…. every time I look at this post, I want to make them again! Im makin it now.. I couldnt find any lump meat tho, so im substituting with claw.. tases really good tho. Im from VA and we usually use lump for crab cakes. Coulnt find any here in Louisiana where im at. I think that would work ok, Tony. As you know, claw meat is a little “darker” tasting and a bit stringy-er, but hey… it’s all crab! Good luck! Brian, I appreciate your being so attentive to your commenters! This pie is on our “next make” list before the holidays are over. Thanks, Ben. I hope you do get a chance to make it. This may be a new Holiday Tradition at our house too. Let us know how it turns out for you. Thanks Brian, Can’t wait to make it. Like seeing the alternatives . Happy New Year ! That’s great, Susan! Thank you for the compliment, and thanks for telling us how well it turned out for you. In the oven now. Taking them to a party. Will let you know how they turn out. Thanks for sharing. I can’t wait! Can’t wait to hear how the pies were at the party! Thanks, Amanda! Well Amanda? How did the pies go over? Just tried the recipe….added a twist…added some sprimp and bay scallops…came out awesome…thank you for this recipe. I would think the shrimp and scallops would really change the texture of the pie. Woo hoo Talena! Glad to hear it! And thanks for letting us know! I made the crab pie this evening for a gathering and it was a hit! Very easy to make and satisfying! @Kelley – Awesome! I’m so glad you and everyone liked it. Good luck Brenda! I’m sure it’ll be a hit. Let us know how the pie turned out Brenda. I was thrilled to have ours turn out so good for our first attempt! I am allergic to shellfish. Do you think this recipe could work with flaked Tilapia? We think Tilapia would make this a very “fishy” pie. Why not try the fake crabmeat that is made from cod fish instead? Going to store tomorrow to buy all the ingredents to make this, can’t wait to try. OMG……I just made the crab pie…DELICIOUS!!!!!!! Yea! Carol, we’re sooo glad you loved it!! Oh my goodness! These pies are to die for! They taste amazing! No leftovers….everyone loved them and wanted more! Definitely a keeper! Thanks for sharing! Awesome, Kathy! Happy that you and everyone loved them. I know everyone is going to think I’m crazy, but is it possible to make this without the cheese? I abhor it, but am unsure if the density and texture of the pie is even possible without it? @Mary – I’m sorry you don’t like cheese. I think you would be fine leaving the cheese out if you must. I don’t know what you folks do for a substitute, but the crab and eggs and mayo make a nice base. I think you’ll be fine. Thank you! I’d probably make one with, as my husband and family love cheese, and then one without for me (which he will also eat, lol). Thanks again, and Happy New Year! Just baked it and it is delicious …. I just wish I knew what to have with it !!! BigDog, have a side salad, or (as is customary with steamed crabs) , cole slaw and/or corn on the cob! Can you use any cheese? I am not a fan of Swiss. Thank you. @Toni – You sure can. I would recommend a mild cheddar, or Gruyere or even a Pepper Jack to make it. Good luck! You’ll love it no matter what your favorite cheese is. Just pulled the two pies out of the oven, still hot, and can’t wait to try!!!! How did you like them Garry? Some of my friends and family don’t have anything but emails and I would like to send this recipe to them. You have everything but email to forward it. Is there some way you could email the recipe to me? Hi Tom, you can go to this pdf file and save it on your computer, then email that to them. I hope this works for you . Let me know if you need anything else. Hi Brian! Thanks for your response but I have a couple more questions as I am making this for New Years day. I will be using the Marie Callendars frozen pie crusts. I saw that you said to thaw and precook but I just need to know how much to pre cook? All the way done or just the 3 minutes you mentioned above? Also, if I wanted to add diced red bell pepper which liquid should I reduce a little so it doesn’t get too watery? You said I could use light mayo but I think I’m going to stick true to your recipe with the full fat version 🙂 Thanks for your help and Happy Holidays!! 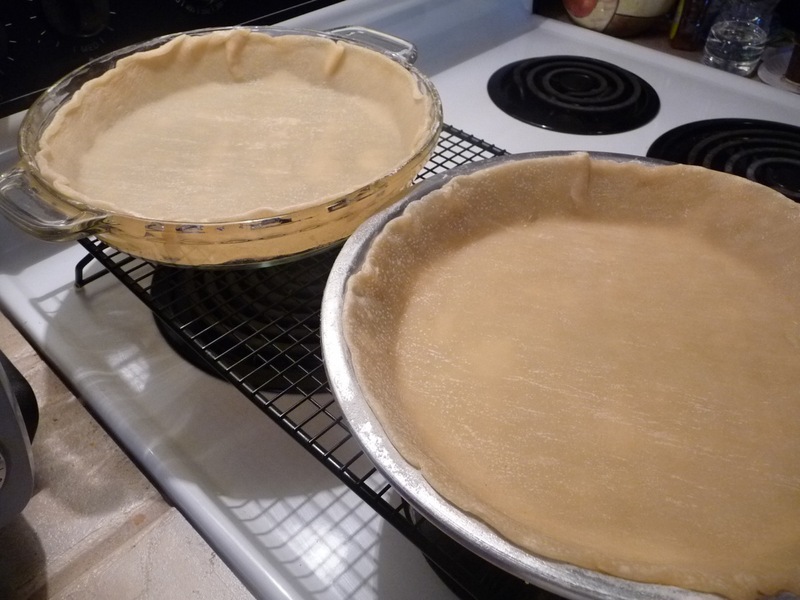 Phay – we used frozen pie crusts too. So 3 mins to par-bake will be fine. If you are subbing the red bell for the green bell in the recipe, no change needed. If you are adding the red bell, I wouldn’t worry about the liquid. It will still set up nicely I think. I would just use whatever spice you enjoy. Old Bay is excellent with a lot of seafood. Use what is good for you and enjoy !!! I know some folks are allergic to the mace in Old Bay, but you could substitute a blend of celery salt, paprika, black pepper, and a touch of cayenne. Thanks Cindy! Glad to hear it. Looked at some of the comments about variations…I will be making this pie once the Louisiana blue crabs start running again. But, seems to me, you could also use crescent rolls, or biscuits to make the crust, and bake them in muffin tins-any size. I will be trying that, myself, soon. Thanks for the recipe-it looks absolutely delicious. Nice idea, Jane. I would love to try these as smaller “appetizer sized” pies. @Donna – it’ll be a big hit! Go for it. No leftovers at all!! This was an excellent recipe. It destroyed some folks New Years resolutions but they’ll recover lol!! Thanks again for all your help and the recipe. Wow! Great to hear Phay! Sounds like a new “tradition” for you. One of my friends had shared this recipe on Facebook and it sounded and looked delicious. I was anxious to make it for New Years Day Breakfast. I used Premium Lump instead of Back Fin and it was outstanding! We are a crab-loving family and my parents, husband, sister and friends gave it a 10! Thank you so much for sharing, it was truly delicious and I am so excited to have this amazing dish to add to my repertoire. I can’t wait to make it again! Thank you for the nice comment, Melissa. We’re glad you enjoyed it. It has definitely become a holiday tradition for us. 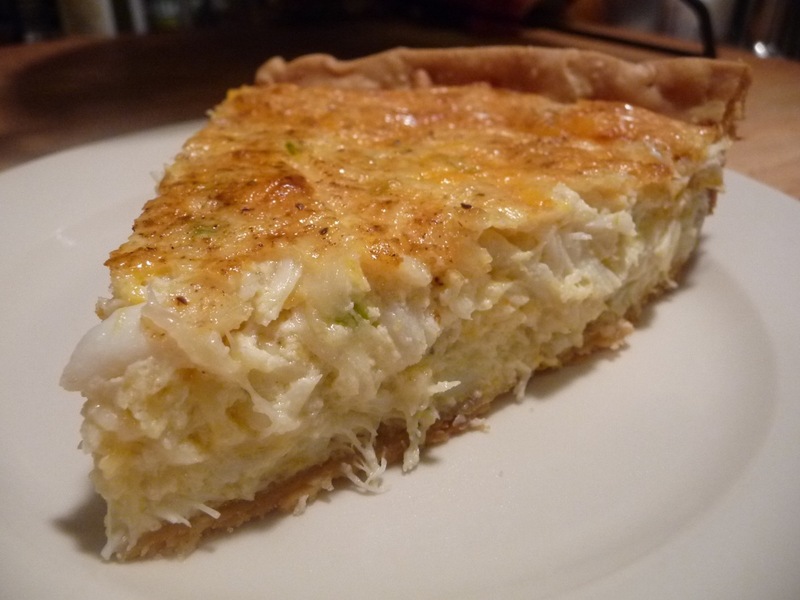 Made this crab pie without the crust and added a dash of tabasco… perfect. Served with salad and white wine. That sounds like you made an awesome Crab Dip, Laura! Great to hear, Donna! Happy New Year to you and yours. Do you add Old Bay into the mixture AND sprinkle it on top? Yes Patty. The 2 tsp of Old Bay goes into the mixture. You can sprinkle as much as you’d like on the top. If you ask me, it’s hard to have too much Old Bay! Good luck. Woo hoo! Glad to hear, Iris! Nothing wrong with subbing any cheese you like. And thank you for the update. This looks awesome and I want to make it but I’m not much of a cook. I’m very confused about the pie crusts though. Do you let them thaw first? In the fridge? If so, how long should this take? And then, do I remove the tin pie pan and put the crust in a glass pie dish? And should I get deep dish or regular? Sooo many questions from this novice cook! Thanks in advance! Hi Rebecca, we used Pillsbury’s refrigerated pie crust, that can be found near the crescent rolls in most stores . I think it’s the best. If you use the frozen crusts (I would get the deep dish if I were you), just follow the box’s instructions to thaw and precook for a few minutes. I find the frozen crusts to be a little tougher, but if that’s what you have available, you’ll still wind up with a fantastic crab pie! I made this tonight using plain old canned lump crabmeat like you would find in the tuna or canned chicken section and it turned out excellent. Also used refrigerated pie crust. Thanks for sharing! Made this with a combination of claw meat and lump meat, as my store didn’t have exactly what I needed. Did not add a crust and it came out perfectly. Reheats just fine for a few seconds in the microwave. Delicious! I wondered how it might taste with some claw meat in it. Thanks Darla! Rebecca, I am the worst cook ever and made two today and they are simply delish! I followed the recipe exactly. I didn’t know if I should hand mix or use a mixer so I did it by hand. I actually bought bread just in case it came out more like a dip but don’t need the bread. It firmed up nicely. Thanks Brian. This will be my “go to” recipe when I have to bring a dish to a party. Awesome to hear, Sharon! Hand mixing is correct, btw. Sounds amazing! I am going to make this next weekend but would like to know if anyone has substituted Greek Yogurt for the mayo and if so, how was it? Thank you! Hi Brian, any experience with the Greek Yogurt?!?! (see above) Thanks! No, sorry. Maybe someone else will chime in about it. Thanks, perhaps I will be the test case! Carol, I would be worried that the yogurt would break down in the baking process, making it watery. Since mayo contains eggs, it would probably set up better. But if it worked for you, please let us know! Carol, I haven’t tried it yet but in my research, mixing greek yogurt with a beaten egg provides enough for casseroles to set up. Since I need low fat, I’m going to look to egg substitutes. This is a fabulous recipe! Delicious! I can’t improve on the comments already stated so I’ll just make one additional note: the caption to one of your pictures says that the piece of pie is shown on your dad’s antique pie slicer. That isn’t correct. It’s not a pie slicer! The proper use of this handy little gadget is this…you are supposed to place the gadget under your pie crust before filling the crust and baking the pie. Then, you slice around the gadget when cutting the first piece and can then easily lift the first piece out of the pie without breaking it. I’m not sure what it is called but I’ve used one for a lot of years and they work great! I didn’t know that RuthAnn. It’s one of the many bakery gadgets and tools I brought home when we were finalizing Dad’s house and estate after his passing. Dad owned and ran his own bakery in Baltimore in the late 1950’s before essentially being forced out of business from the growing encroachment and popularity of the “big stores” of Acme, Safeway and the like. I would love a printable version of this please!—-Thanks! Renee, Mary, and Nancy… I’ve updated the post with a link to a printable version. Thanks! Great, Thanks! I will be making it this weekend. Just made this for dinner and it was FABULOUS! 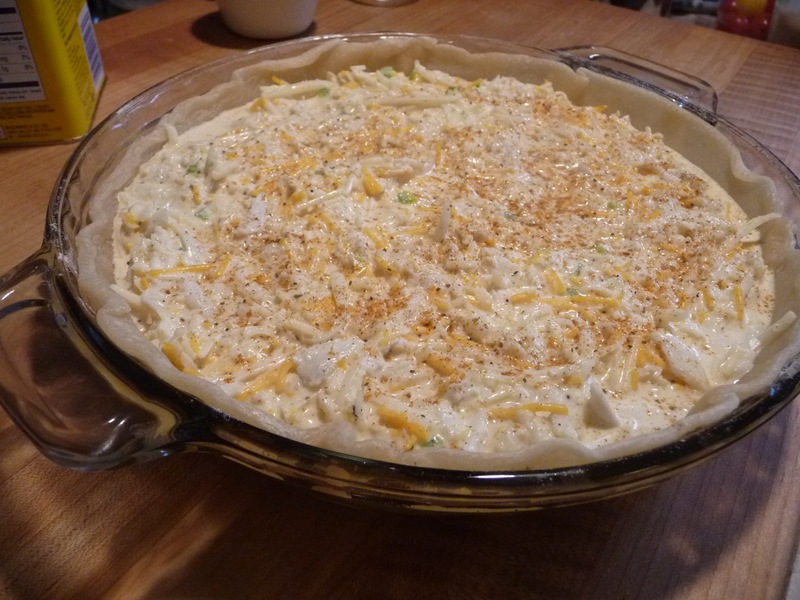 Cut the recipe in half for just one pie, but since I have more crabmeat, I am seriously thinking about making another one! Good point, Shelby. The recipe is certainly easy to “halve” for one pie. This Crab Pie was Da Bomb!!! I usually do not make changes to recipes the first time I make them but I was forced to because I only had 1/2 lb of crab meat. I picked up the wrong container. I had some small peeled deveined shrimp that I sauteed in the a skillet and drained that I was able to add in. I really like the taste of peppers and onions so I doubled the amount. The pie had a great taste and set up very nicely. I think the next time I make it I will try a 13×9 pan so I can serve as appetizers. Usually I substitute provolone for swiss in recipes because I do not like it but I really could not taste the Swiss. Thanks for sharing! Good to hear, Thaddeus! This recipe is very flexible! As we can see from all of the Comments, it really does lend itself to different situations. No, I’m sorry Molly. I don’t. But surely good for the soul. Thanks, Brian! That’s a good story, Christy! Glad everyone enjoyed it. Thanks for sharing. This recipe was delicious!!! My family and friends loved it. I plan on making it again once I am done with my fast. Love it! I just popped these in the oven. Can’t wait to try. One will go to my mother-in-law, she had surgery yesterday. I hope they turned out well, Cindy. Good luck to your mom-in-law. I relocated to Michigan 20 years ago, and always miss my seafood – especially blue crab. My friend’s daughter started college at Johns Hopkins last fall, and they recently sent me this link. I instantly knew I was going to try it. I made it tonight – original recipe, only substituting red peppers for green – and with a breadcrumb/butter topping for my pickier, Midwest family members. I found the topping to be completely irrelevant, but my husband preferred the pie with the topping. Either way, it was definitely a success in my house! Thanks for this recipe. It was a big hit! I was thinking this might be a great Super Bowl party dish. 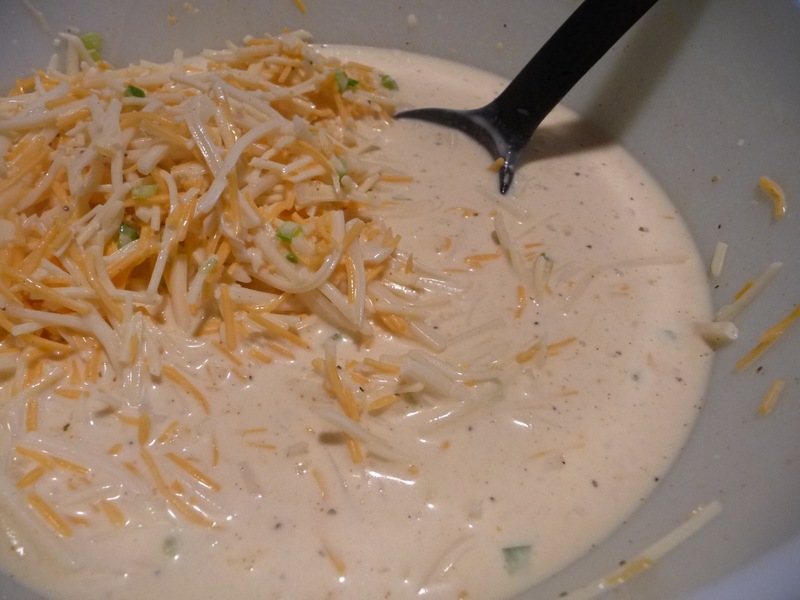 I added a bit more onion and green pepper, and had a mix of cheddar, swiss and gruyere cheeses. Thanks again! Made tis tonight and it’s absolutely delicious!!! Thanks for sharing the recipe. Thanks Howard! You are welcome! We’ve heard from quite a few people that have added shrimp to the pie. Apparently it’s very good that way too! I love shrimp, but I’ll stick with the original recipe for now. Thank you Christinia! Glad you liked it. We used dairy case dough, so I’m not sure. Just follow the directions on the frozen dough box. But my best guess would be yes, thaw the dough first. Wow! Sounds like you really kicked this up a notch or two! Thanks, Yvonne. Glad you liked it! Just a word of caution…the antique pie cutter is a no-no…it is made with zinc, which will leach poisonous zinc into the food every time it touches what you eat. Hang it up and just admire it. And enjoy the pie! Awesome, Beverly! So glad everyone liked it! I love Phylo dough, but never thought of using it for this pie. My co-worker (Steve) told me about this recipe and I can’t wait to try it!!! I’ve had this recipe saved for about 2 months now waiting for the perfect time to try it. I will be making it for my sweetheart and I on Valentine’s day. I can’t wait to see/hear our reactions. Seeing that I read every single comment, and NOT ONE bad review, I’m sure it will be amazing. I’ll be sure to keep you posted. Then he’s a very lucky guy, Joelle! I’m sure you both will enjoy it. I prepared to make this dish on this very snowy day in Prince George’s County…just took them out of the oven and I’m at a loss for words on describing it. Everyone has already told you. Delicious, easy, moist, delicious again LOL … It’s just pretty darn amazing. Thank you so much for sharing. I’ve tasted others and many were dry…not yours. Did I say awesome? There goes my weight watchers points! Hey, Shell. Thanks for sharing that with us! It makes us feel good that you enjoyed it so much. Great Joelle! I’m so glad you reported back, and glad to hear it turned out good for you both. My husband is allergic to hard shell seafood .. So I am going to try it with canned And fresh shrimp to try and get the texture of crab… We both live quiche so wish me luck !! This has been making the Facebook rounds, so I decided to try it. Absolutely divine! It’s in the oven right now because my husband requested it for dinner (I forgot to post the first time I made it). Thanks for sharing!! Loved the recipe but im not a fan of swiss cheese so I used pepper jack. Used 1/2 cup mayo . Used heavy whipping cream instead of milk ( fattening I know lol ) & added fresh garlic! Omg! My 1st time ever baking with crab meat and I must say it came out great!!! I also sautéed my green peppers and onion in butter first then mixed it in the recipe. I also got a block of Swiss cheese and used my shredder to shred it! I must admit I’m not a fan of Swiss cheese so I almost skipped it IM GLAD I didn’t! I can’t even tell it’s made with Swiss cheese!! My husband, 6 year old and 12 year old LOVED it!! I served it with green peas and Mac n cheese because my 4 year old wouldn’t even try it and I didn’t want my 1 year old to try it because it’s really rich but who knows maybe tomorrow I may let her try a piece. Wow, that’s a small crowd you’re cooking for Natasha! I’m glad it worked out for you, and thanks for letting us know. This was the best pie ever. My husband loved it. The only concern that we have is what is the proper way to reheat leftovers. I zapped a piece in the microwave for 45 secs and he said that it didn’t taste the same as when I took it out of the oven last night. Please help how can I successfully reheat. It is too much to go to waste and it was so delicious last night. It’s good as a cold leftover, but to reheat, I would put it in the oven, or better yet, a toaster oven – cover with foil to prevent burning, and heat away. I finally had a chance to make it and my husband loved it took one to work and my co-workers Paul, Josh and Heather said it was great. I will make this again!!! Hey Brian!! I made this for the first time on March 16 and today is my husband birthday. Guess what his dinner request was?!!! Yep crab pie!! Got 2 in the oven right now!!! He also said he wants one pie all to himself :•) my 6 year old jumped for joy when she saw me put them in the oven!! I can’t wait till they’re done!!! Woo hoo! Winners all around! Thanks for telling us, Natasha! I made this and it was great. My husband wants me to make it again this weekend. He wants one for work and one for home. Awesome, Connie! Glad you liked it. Can you put mayo in the oven & NOT get sick? Yes, of course. Crab cakes are a good example of a recipe that needs mayo and gets fried, baked or broiled with no ill effects. Perfect. I did not do the pie, but used a mini-muffin pan with pieces of crescent rolls as the crust. Spooned in the mixture, sprinkled with old bay and then cooked for 15 minutes at 350. Your recipe made about 55 mini crab “pies” which were taken to a cookout. They were a hit. Hey, that’s a great idea Mike. And thanks for the count – about 55 mini crab pies, huh? Nice work. Did you basically make a “cup” out of the dough for each mini-muffin? How did the Crab Pie turn out for you? I have been making a very similar version of this since 1995, from the now defunct Gourmet Magazine – which I still miss – and it has been a family fave since. 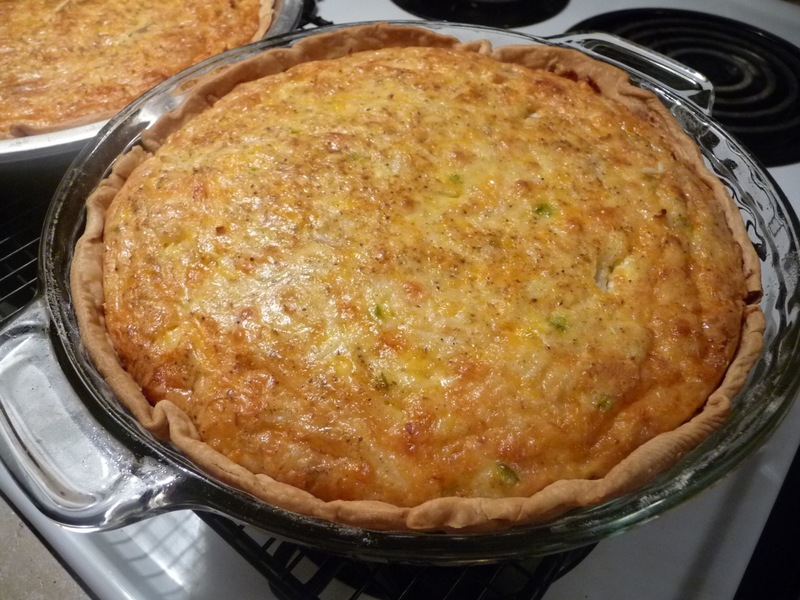 I was so happy to find such a similar recipe and that you are sharing the Crab Pie love! So much positive feedback! It makes me happy to know that I am not the only one who loves it! The Gourmet version is for a single pie, but uses different seasonings, so I am intrigued by your recipe and will be trying it! And since I have been making this for almost 20 years, I have always used 2% milk and lower fat (not nonfat) mayonnaise without any problems! Thank you for your wonderful blog! It made me so happy! Wow wgaz! Thanks for the great feedback and kind words. I encourage readers to use low fat ingredients if at all possible. 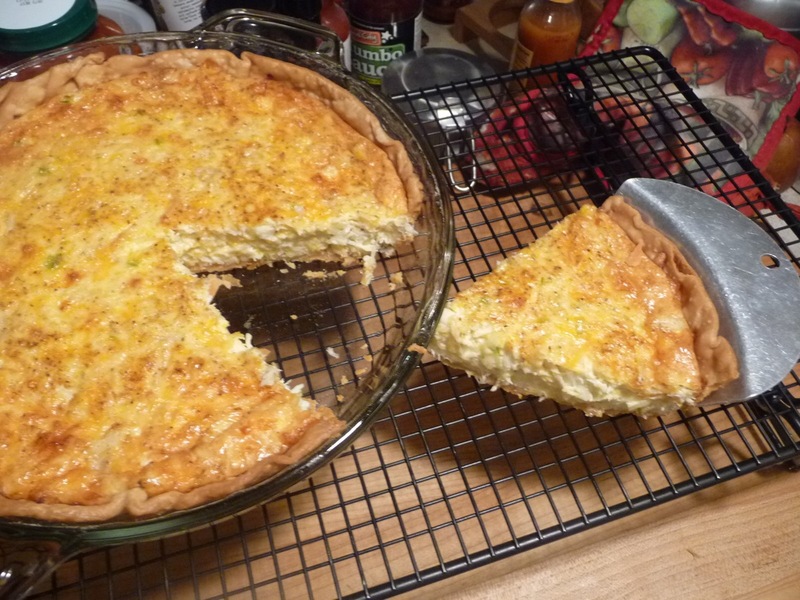 I forgot to mention that if I make it for a fancy occasion I make in a fluted tart pan with a removable bottom. It makes for a great presentation! I wanted to make it, but 2 pies from recipe? Was so easy to half it and it was delicious! Hey, glad it worked out for you, Trudy! And thanks for verifying that halving the recipe works.